WorldECR is published by London, UK-based DC Houghton Ltd. First published in 2011, WorldECR is today widely recognised as the leading journal reporting on developments in international economic sanctions and export controls and a valuable resource of information pertaining to the various national regimes and good practice in compliance with – and navigation of – those regimes. 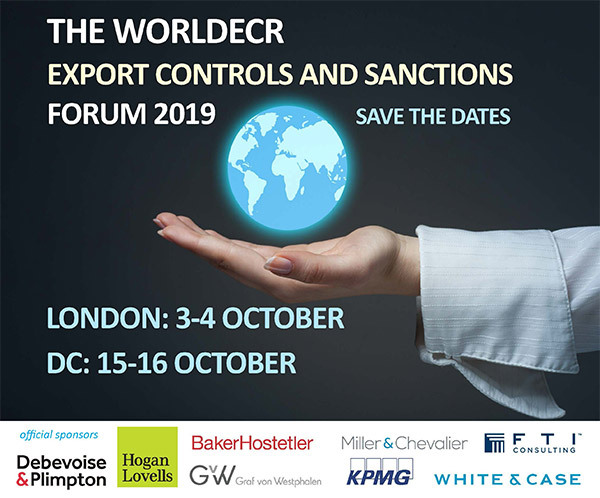 Currently, WorldECR hosts two ‘Forum’ events each year – one in London and one in Washington, DC. These events bring together export and trade compliance professionals, legal practitioners, professionals from government, NGOs and academia, in a collaborative environment for discussion and the sharing of ideas and information. DC Houghton also publishes books on trade compliance: currently, those include The Export Compliance Manager’s Handbook and Dual-Use Export Controls of the European Union. We also publish Trade Security Journal. Launched in 2017, TSJ focuses on the global trends and key regulatory developments that impact corporate trade compliance, supply chain and reputation – such as: bribery, AML, human rights, cyber crime, data protection and privacy, and national security-related foreign investment controls.